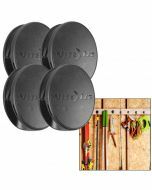 With its strong, bendable wire interior and sturdy rubber exterior, the Nite Ize 12" Gear Tie is the perfect size for bundling, connecting, and organizing everything from workshop tools to children's toys. With a simple wrap-and-twist motion, it keeps appliance wires, cables and cords tangle-free, organizes tools, art supplies, and sporting equipment, binds and neatens kitchen gadgets, craft supplies, toys, and more. Reusable, water-proof.